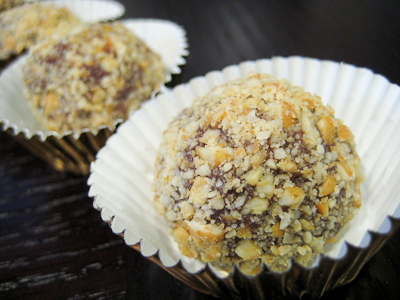 This week's Sweet Melissa Sundays (SMS) recipe was chosen by Mara of Love Your Mother: Peanut Butter Truffles. I'm a day late with this one but could not pass up chocolatey peanut butter candies! The recipe is straight forward and easy. Just heat up some cream and peanut butter, pour it over some chopped chocolate to melt the chocolate, then add some butter. Refrigerate until firm, then form into balls and roll in peanuts. That's it. I found the chocolate to be very soft and hard to work with, even after chilling in the refrigerator for 6 hours. The best way to make these would probably be to roll them into balls and then freeze them. 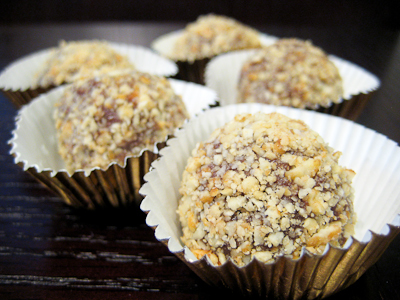 You can then take the frozen truffle balls and dip them in chocolate. Several SMS bakers did this with great success. I made a few truffles as directed in the recipe, and have the rest in the freezer right now so I can dip them in chocolate... but, since I'm already a day late posting, I thought I'd get this post up with at least what I've made so far. Based on recommendations from other SMS bakers, I went ahead and doubled the amount of peanut butter in these truffles and I think they turned out great. You can certainly taste the peanut butter in them and the chocolate is so smooth and creamy. If you would like the recipe, you can find it here. 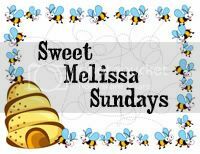 Make sure you check out the Sweet Melissa Sundays Blog Roll to see how everyone else enjoyed these peanut buttery treats. - I used semisweet chocolate chips instead of bittersweet chocolate. - I also doubled the peanut butter and used a half cup. - For more tips, click here. Great pictures Jaime! I'm glad they worked out well with double the peanut butter - now I know exactly what to do next time :) I could not get the peanuts to stick, would love to hear how you did it so successfully! Looks yum! 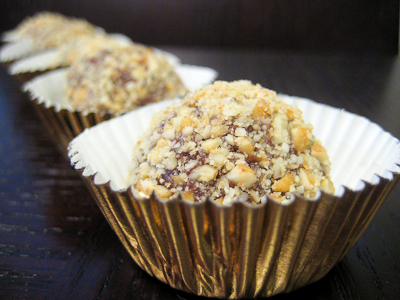 The gold liners hint at the richness of these decadent truffles perfectly! Chocolate and peanut butter were just MADE for each other! These look delicious! They look great! Wish I'd have seen the doubling the peanut butter suggestion as it seemed most of the peanut flavor in mine came from the peanut coating. Glad you liked them! Glad you liked them! Mine definitely could have used the extra peanut butter as it seemed most of the peanut flavor came from the peanuts on the outside. These look decadent. Thanks for the excellent idea.